Spring is in full bloom, but there is still plenty of time to get your spring cleaning on! 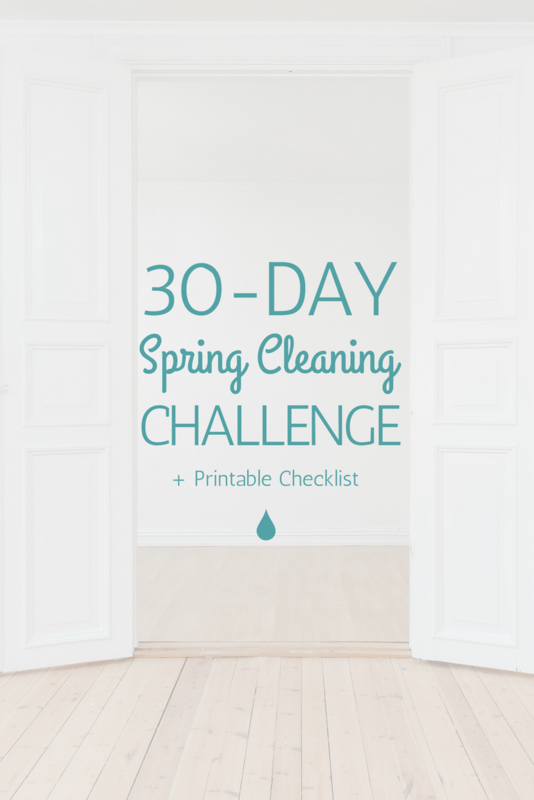 For those of you who are ready to tackle the deep cleaning, we invite you to participate in the 30-Day Spring Cleaning Challenge. 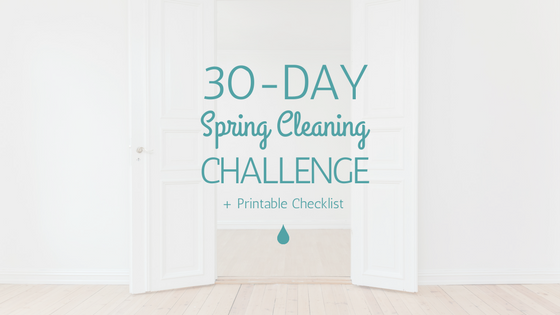 This challenge comes complete with a free download to our printable 30-Day Spring Cleaning Challenge Checklist, perfect for sticking on the fridge and marking off as you navigate through the challenge. So, keep reading below to find out how you can conquer cleaning your house or apartment home in just 30 days. And don’t forget your checklist! 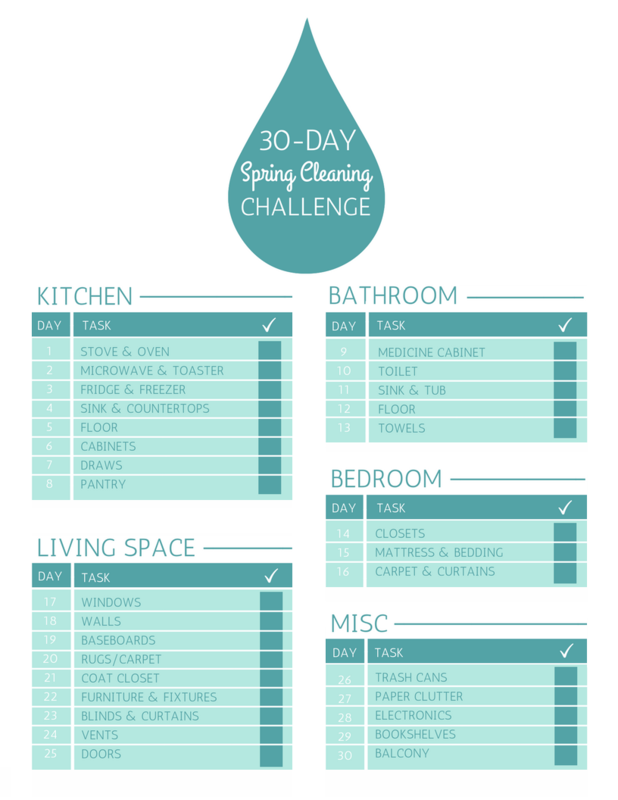 The 30-Day Spring Cleaning Challenge is broken down into different sections. That way you can efficiently tackle specific areas of your home one day at a time. Each day is a different task, so set aside the month and follow the schedule for tidy, spring-fresh household. Day 1: Clean the stovetop and oven. Day 2: Clean the microwave and toaster. Day 3: Get rid of anything that needs to go in both refrigerator and freeze. Then scrub them both inside and out. Day 4: Scrub the kitchen sink and countertops. Day 5: Wash the kitchen floor. Day 6: Clean out and wipe down cabinets. Day 7: Get rid of any junk in the draws. Day 8: Remove any expired items in the pantry and clean/dust any necessary areas. **Tip: Try making your own chemical-free cleaning products. Day 9: Clean out the medicine cabinet. Day 10: Scrub the toilet inside and out. Day 11: Wash the bathroom sink and tub. Day 13: Clean towels and get rid of any old, worn out linens. Day 14: Go through all closets and get rid of anything you don’t wear. Make sure to vacuum before putting what you are keeping back. Day 15: Flip the mattress, clean the sheets and any bedding. Day 16: Deep clean curtains and any carpeting or rugs. Day 18: Wipe down the walls and touch up any paint. Day 19: Clean any baseboards. Day 20: Deep clean any carpeting or rugs. Day 21: Clean out coat closet. Day 22: Vacuum and dust all furniture and fixtures. Day 23: Deep clean blinds and curtains. Day 24: Clean/Vacuum dust building up in any vents. Day 25: Wipe down doors. Touch up any paint and adjust any locks or hinges if needed. Day 26: Wash out trash cans. Day 27: Go through and get rid of any paper clutter. Day 28: Dust off electronics. Also, consider donating or recycling tech you no longer use. Day 30: Tidy up the balcony or patio.